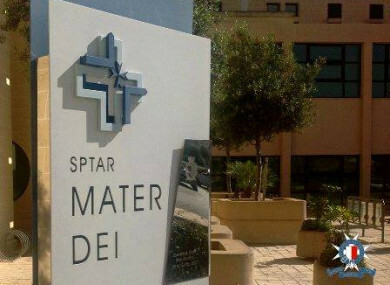 Mater Dei Hospital where the man was taken. AN IRISH MAN is in hospital in a serious condition after being hit by a car in Malta this morning. In a statement, the Malta Police Force said that they were called to an incident at The Strand, Sliema – a resort town on the east coast of the island – at about 9.30am local time (8.30 Irish time) this morning. Police said he had been struck by a Volkswagen Golf driven by a 67-year-old woman who also lives in the area. An ambulance was called and the man was taken Mater Dei where he was described as suffering from “grievous injuries”. “A Magisterial Inquiry was appointed on the case whilst police investigation is still on going,” police said. Email “Irish man suffering from 'grievous injuries' after being hit by car in Malta”. Feedback on “Irish man suffering from 'grievous injuries' after being hit by car in Malta”.